"The New Men of the Sixties," in contrast to the leading illustrators of the previous generation such as George Cruikshank, Hablot Knight Browne ("Phiz") and John Leech, were formally trained rather than self-taught. Like John Everett Millais and Luke Fildes, Frederick Walker was a graduate of the Royal Academy of Art. However, Walker's academic preparation was rudimentary at best, and his surviving letters reveal little reading in the classics and no knowledge of a foreign language, although a fragmentary poem of his survives in the Witt Archive. 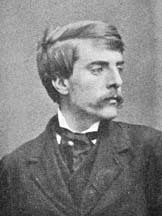 Even if he did not attend the ateliers of the Continent as his great admirer George Du Maurier did, Walker is still a possible model for Du Maurier's "Little Billee" in Trilby (1894) because, through his association with him while an illustrator for Once a Week, Du Maurier would have experienced first-hand Walker's complex and often contradictory character: on the one hand, Walker was shy, reticent, and sensitive with strangers; on the other, high spirited and fun-loving with friends. Frederick Walker, the son Marylebone jeweller William Walker, was born in London, on 26 May 1840, and died in St. Fillans, Perthshire, on 4 June 1875. After just a few years at the North London Collegiate School, Walker became for a short time an architect's apprentice. Pursuing his childhood interest in drawing, at seventeen he became a student at the Royal Academy school in London. Walker acquired most of his training in drawing and painting through studying in the British Museum, where he copied extensively from antique sculpture, especially the Elgin Marbles from the Parthenon. In the evenings he attended life classes at Leigh's Art School. At the end of 1858, he began a two-year apprenticeship with Josiah Wood Whymper (1813­1903), in whose workshop he met his life-long friends the painter J. W. North, A. R. A., and the noted illustrator George Pinwell, A. R. W. S.
It was through Whymper, too, that Walker began to illustrate for the Dalziel brothers. In 1859, Walker's engravings began appearing in the new London illustrated magazines such as Good Words, Everybody's Journal, and Once a Week; in 1860 William Makepeace Thackeray accepted some of Walker's illustrations for his new journal, the Cornhill Magazine. Although Walker's biographer, John George Marks, does not mention the artist's having known Dickens, Walker is associated with some of Dickens's friends, including the writers Mark Lemon and Wilkie Collins, and the artists John Leech (with whom Walker used to go horseback riding), Sir Edwin Landseer, John Everett Millais, Daniel Maclise, Sir John Tenniel, and Sir John Gilbert, who was commissioned by James T. Fields to illustrate Dickens's A Holiday Romancein 1868. At the end of 1860 Walker was approached, through the publisher George Smith, to redraw illustrations from Thackeray's own sketches for The Adventures of Philip which was about to be serialised in The Cornhill Magazine. Walker met Thackeray and won the commission by executing a neat sketch of the Author shaving. Philip began to appear in January 1861 but Walker could not bear to merely copy Thackeray's sketches and bravely refused to go on unless he was given freedom to interpret the subjects in his own way. Thackeray accepted Walker's demands and the two were soon on friendly terms— the young man becoming a frequent visitor to Thackeray's home. In early September 1871, Walker undertook the design of a poster (as he said, "a dashing attempt in black and white") to advertise Wilkie Collins's own adaptation of The Woman in White, scheduled to run at the Olympic that fall. On a huge sheet of paper (which in a letter of September 6th to Hooper Walker describes as "the size of a door"), it represents a life-size woman with a huge shawl partly over her head and draped down her back, her face seen in profile as she apprehensively turns back to regard for a second the room she is exiting as she passes out into the starry night. Walker first sketched the outline in charcoal and chalk, then pricked the paper to transfer the outline to wood, upon which Walker himself then drew the complete picture. The original was exhibited in 1872 at the Dudley Gallery, and again in 1876, after Walker's death, the transfer holes made by Walker still distinctly visible. Walker's illustrations reveal careful detailism and a sense of modeling, proportion, and beauty derived from his copying classical models in the British Museum. Among his most important commissions was the illustration of Dickens's Hard Times for These Times. Originally published between 1 April and 12 August, 1854, in Dickens's weekly magazine Household Words, the story had never appeared with illustrations, although the first cheap edition (1865) had a frontispiece by Arthur Boyd Houghton. Although by 1864 Walker, feeling constrained by book illustration, had expressed the determination to devote himself to painting exclusively, he continued to illustrate the work of Thackeray's daughter until 1870. For the 1868 Library Edition of Dickens's works, in collaboration with engraver Maurice Greiffenhagen Walker contributed four drawings to accompany Reprinted Piecesand a further four to accompany Hard Times (165 pages, single-columned). For his first serious painting, "Strange Faces" (1862) Walker had used as his model for the central female figure his sister Fanny. For his first celebrated oil, "Philip at Church," Walker placed his mother and brother in the background. Despite its drawing considerable criticism from John Ruskin, the painting won both a medal at the Paris Exhibition of 1863 and the admiration of William Holman Hunt. Submitted to the Old Watercolour Society in January 1864 along with two earlier works, this painting won Walker unanimous election to the Royal Watercolour Society. Most of the oil paintings that Walker displayed in his 1863 exhibit at the Royal Academy were, in fact, re-workings of his magazine engravings. His most notable such re-worked engraving was "The Vagrants, " which had first appeared in Once a Week in 1866. Although when he exhibited the naturalistic painting at the Royal Academy he failed initially to find a buyer for it, "The Bathers" (1865),"The Wayfarers" (1866), and "The Harbour of Refuge" (all of which, though examples of Social Realism, reveal Pre-Raphaelite tendencies) exerted a powerful influence on such young artists as Luke Fildes and Hubert von Herkomer. As a result of a tour of Somerset in 1868 and to Torquay, Salisbury, Cookham and in Scotland in the four years following with his friend and fellow painter North, Walker produced such stunning nature paintings as "The Plough," "The Old Gate," "The Mushroom Gatherers," "At the Bar," "The Well-Sinkers," "The Harbour of Refuge," "The Right of Way," "The Village," "A Fishmonger's Shop," and "The Street, Cookham" in a new style called "Idyllist." Walker's leadership of a burgeoning school of Social Realism in England was cut short by his untimely death at St. Fillans, Perthshire, on 4 June 1875 "on the ninth day after the completion of his thirty-fifth year" (Marks 312) as the result of phthisis (a hemorrhage in the lungs), which carried him off when he was touring the Highlands for his health. Black, Clementina. Frederick Walker. New York: Dutton; London: Duckworth, 1902. Dickens, Charles. Hard Times and Pictures from Italy. One vol. London: Chapman and Hall,1868. Hammerton, J. A. The Dickens Picture-Book. London: Educational Book . Marks, John George. Life and Letters of Frederick Walker, A. R. A. London and New York: Macmillan, 1896. Milton, Steve. "Frederick Walker." http://www.geocities.com/steve_milton_uk/Walker.html 5 May 2001.